Nonverbal World - All about Nonverbal Communication: Why we smile? Smiling is get a smile back. We feel quite better when somebody smiles at us and we smile in return. Smiling person is loved most than one who presses lips tightly and glares at you. Smile’s magical in human society. It helps in winning people’s hearts and draw sympathy and favor. Smiley and emoticon has become integral part of text messaging and chatting applications around the world. Why we smile at each other so obviously - without training or compulsion? Answer’s both exciting and bizarre. Let’s understand how we came to know about its origin. 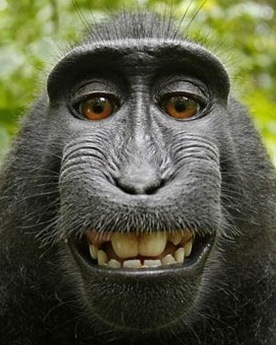 Very few of us might know that our primate cousins (apes and monkeys) also smile at each other. In their society, smiling has lot to do with social harmony, dominance and survival ultimately. When two primates stand in front of each other or pass along side, they open their mounts slightly so that teeth should get displayed. By doing this, they make each other feel safe by passing a message, “Don’t scare. I’m not bearing teeth at you. I’m friendly.”. It's only the dominant male in their group who doesn't show his teeth to others. He uses his teeth only to bite and injure his sub-ordinates or rivals to proclaim his superiority or control. In social situation, direct eye contact made with enlarged eyeballs and pressed lips is a classical sign of threatening or intimidation. If any person is confronting to such kind eye contact made by others for a considerable amount of time, it’s assured that it would result in either running away or retaliation (limbic flight or fight response). Elongated hostile gaze leads to parasympathetic distress and our primate cousins use same strategy smartly. Dominant male gorillas stare with hostile facial expressions to control large group of sub-ordinates and to derogate rebellions or rivals. It's sort of territorial invasion and also invitation to fight. Thus smiling is comparatively less related with lips and teeth than eye balls and gaze. Orbicular muscles (Orbicularis Occuli) around the eyes unconsciously contract while smiling to convey that an individual is afraid of other person(s). Contracted orbicular muscles helps to protect eyes from possible attack and also reverse the effect of stronger gaze i.e. our eyeballs appear smaller. Separating both lips and turning their corners upward might have evolved to enhance orbicular muscles (Orbicularis Occuli) contraction. Displaying teeth along with fearful gaze creates overall effect of harmless intentions. A thin band of Zomgatic muscles on both side of face arising from Zygomatic bone i.e. 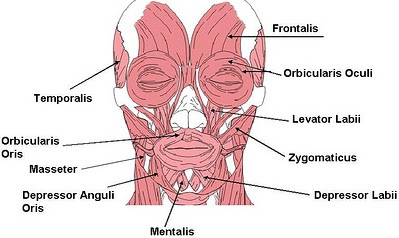 near the outer edges of eyebrows and merging into Orbicularis Oris muscles (circular muscles around lips) at both corners of mouth contracts and pulls edges of lips upwards while we smile. Also puffed cheeks due to this pull provides additional protection to eyes. Smiling or looking at smiling faces associated with Endorphin (a neurotransmitter) secretion so as to induce happy feelings in mind even if smile is genuine or fake. We portray different kinds of smiles for expressing acceptance, approachability, innocence, happiness, friendliness, agreeableness, fondness etc. All these facial expressions are non-threatening for others. We can portray 43 different kinds of smiles. Labels: Animal Kingdom, Evolution, Facial Expression, Psychology, Relationship, Social Practices, Why we do? Very interesting article. How nice when someone serves you smiling!